Imagine buying a car only to find out that one of its safety features is missing. That's exactly what's happened to thousands of unsuspecting consumers who have purchased the popular Chevy Impala as used cars, reports "Early Show" Consumer Correspondent Susan Koeppen. The says the Impalas in question were at one time part of a car rental fleet. The safety equipment that's missing is the side airbags. But, as her team found out in a hidden camera investigation, many of these cars are sitting on used car lots -- up for sale -- with window stickers that claim the cars have those side airbags. Side airbags are standard equipment on the Chevrolet Impala -- but thousands are being sold without this important safety feature. On used car lots in three states, "The Early Show"'s hidden cameras found Impalas advertised with side airbags. However, in reality, those airbags were missing, Koeppen reported. That's was the case when Connie Wittkopp purchased a used Impala from Enterprise in Kansas City. The paperwork said side airbags were included. Wittkopp told Koeppen, "How could they have a clean or clear conscience knowing that they're going to sell that car to someone who could go out here and get killed?" Wittkopp had no idea her car was part of a deal where General Motors allowed rental car companies and fleet buyers to delete side airbags at the factory to save money. Now, more than 100,000 Impalas without side airbags are making their way into the used car market. Sean Kane, a safety consultant from Safety Research and Strategies, a safety advocacy group, said, "In all the years of our work in motor vehicle safety, we have never seen a standard feature deleted from a car in this kind of way." Kane said he was shocked to discover side airbags deleted and replaced with plastic. Kane said the effort saved fleet buyers $145 per vehicle. "This was a concerted effort by General Motors to give fleet customers an option of saving $145 at the expense of safety," Kane said. 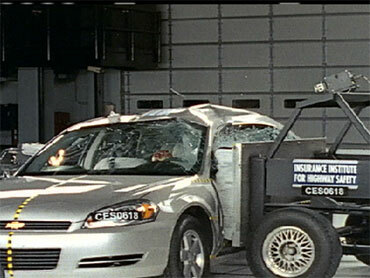 Wearing a hidden camera, "The Early Show"'s team went to several used car lots across the country that advertised the Impalas in question as having side airbags. Koeppen said they wanted to see what consumers were being told on the lot. An "Early Show" producer asked a salesperson if one of the Impalas in question featured side curtain airbags. The salesperson replied, "Yes, it does." In Houston, Texas, another salesperson didn't realize the airbags had been deleted. But Koeppen said her team knew side airbags had been when they found the deleted option code "AK5" on the vehicle identification plate in the trunk. The door trim was also missing the word airbag, which the salesperson eventually noticed. The salesperson told "The Early Show" team, "This one actually does not have it, doesn't have the side impacts on it." "The Early Show" producer asked, "It doesn't?" The salesperson confirmed, "It doesn't." In Oklahoma City, Koeppen's team found another Impala with deleted airbags, a salesperson told "The Early Show" producer that, in fact, the car did have the airbags. The car's window description listed "passengers front airbag and side airbags." And in Providence, R.I. the CBS affiliate, WPRI, went undercover with the same result. The salesperson said at that dealership, "They said that there's airbags in there." Kane said, "To see them being sold in dealers, in many cases unknowingly, is a really a problem that goes back to General Motors." As for Enterprise, the company offered to buy back their vehicles for $750 over the Kelley Blue Book value, or pay $200 for the customer's inconvenience. Enterprise told "The Early Show" it would give Wittkopp full value for her car, but she's still angry. "People's lives they're worth a whole lot more than just saving money by leaving stuff off the vehicle," she said. "No, you don't do that." Enterprise, which admits it incorrectly listed some of these cars on its Web site for sale with side airbags, says, "We have apologized for the error we made, and we have done, and continue to do, what we can to rectify the situation with our customers." General Motors says these vehicles "meet or exceed federal safety standards." The company no longer allows airbags to be deleted. Koeppen added on "The Early Show" that General Motors has sent out a message to dealers saying they should change their window stickers, advertising and Web sites to reflect the airbags in the cars. Koeppen said each dealership was told about "The Early Show" investigation and were told what the teams found. However, she said one dealership still has not changed their Impala advertising. Koeppen advised, "So if you're buying a used car -- any used car -- make sure you do a really thorough background check on the car."